When heated above a certain temperature and under friction amber firstly volatile substances are being eliminated: aromatic hydrocarbon. Thus there is an odor of amber resin, which has healing effects in diseases of the respiratory system, including the common cold, laryngitis, tracheitis, bronchitis, pneumonia and even asthma and tuberculosis. 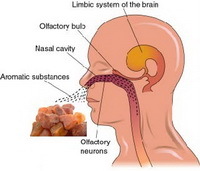 In this case healing properties of amber are related with the inhalation of negative ions, enabling the metabolic processes in the upper airways, trachea, bronchi and alveoli of lungs, contributing to the withdrawal spasms, improving of blood circulation, elimination of swelling and inflammation, and direct bactericidal action on microbes in the airways and in the lungs. Because of usage for therapeutic purposes, the impact of volatile compounds of amber can be considered as a variant of aromatherapy. When burned, additional compounds release, including vapour of amber acid and alcohols, which can accelerate the biosynthesis, including fruit ripening. Production of amber aromatic hydrocarbons is no difficult even at home. Pour crushed amber in a plastic bag. The bag with crushed amber put on a tray and in the microwave oven for three minutes at the maximum temperature. The bag with crushed amber can be heated in a water bath as well. When heating amber stone, intermolecular bonds are being broken and aromatic hydrocarbons are released, providing the peculiar smell of amber resin. Breathe over this package for 3-5 minutes. Amber aromatherapy has no contraindications. Amber aromatherapy is particularly effective in various diseases of the respiratory system - from a common cold to asthma and tuberculosis. The same package with pulverized amber can be reused not only for aromatherapy, but also for massage applications, oral usage, facials procedures etc. Remember that by applying any manner of using crushed amber, it's the best to always warm it up first.